A selfie taken by NASA's Mars rover Curiosity on Vera Rubin Ridge, a landform in the foothills of Mount Sharp. NASA's Curiosity Mars rover has temporarily halted science operations because of a glitch, mission team members announced today (Sept. 19). The mysterious issue, which cropped up Saturday night (Sept. 15), prevents the rover from beaming to Earth much of the science and engineering information stored in its memory, Curiosity project scientist Ashwin Vasavada, of NASA's Jet Propulsion Laboratory in Pasadena, California, wrote in an update today. "Engineers are expanding the details the rover transmits in these real-time data to better diagnose the issue," Vasavada wrote. "Because the amount of data coming down is limited, it might take some time for the engineering team to diagnose the problem." The rover team has turned off all of Curiosity's science instruments while engineers investigate the glitch. Mission team members are also preparing to fire up the rover's backup computer, in case they need it to diagnose the issue with the main computer, Vasavada wrote. 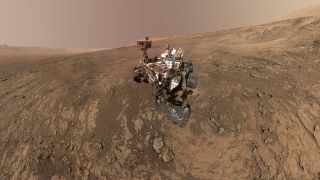 While mission engineers work on the current problem, the Curiosity science team will study the data the rover has already gathered at Vera Rubin Ridge, in the foothills of Mars' 3.4-mile-high (5.5 kilometers) Mount Sharp. Some rocks in this area have proved exceptionally hard, complicating several previous Curiosity drilling attempts. "We're looking at any clues that tell us the rocks are weaker and better for drilling," Vasavada wrote.